A young man (Stanford) and his family travel to the desert to investigate a silver mine they've inherited only to discover that the surrounding area is inhabited by a clan of lunatics. Torture, imprisonment and bloodshed ensue. $15.708 million on 2620 screens. It’s been all of five days since I last reviewed a modern remake of a Seventies horror flick, I guess I’m due for another. Today’s cinematic rehash updates 1977’s The Hills Have Eyes, the sophomore release from Wes Craven. After a prologue that introduces the concept the nuclear testing created genetic abnormalities, we meet Carter family. On their way to California as part of a 25th anniversary celebration for father Bob (Ted Levine) and mother Ethel (Kathleen Quinlan), the extended clan includes son Bobby (Dan Byrd), daughters Brenda (Emilie De Ravin) and Lynn (Vinessa Shaw), Lynn’s husband Doug (Aaron Stanford), and their infant daughter Catherine (Maisie Camilleri Preziosi). They want to explore an old silver mine near Fred’s station, so although he warns them away from there, they continue through the deserted territory. Unfortunately, they get into an accident that disables their vehicle. Doug and Bob set out in different directions to locate help while the others wait. Some weird incidents ensue, but nothing major happens until after dark. The freaks come out at night and terrorize the family for the rest of the film. When I watched the original Eyes, I found a few problems. For one, I didn’t like the lack of realism brought to the piece by the mutants. I thought the terror would have been more effective without such obviously monstrous characters. I also felt its poor production values and its inept actors undermined the movie. It was a cheap flick made without much talent behind it, and those problems showed. 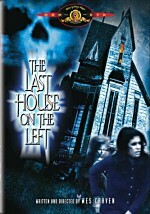 Craven matured a lot since his first flick – 1972’s Last House On the Left - but the others who worked with him didn’t demonstrate much skill. The actors fared especially poorly, and their lack of ability actively harmed the project. Without question, I can’t knock the 2006 Eyes for its actors. We get solid veterans like Quinlan and Levine along with a mix of talented younger performers. All acquit themselves just fine in this flick. They act rings around the schmoes from the first version and add immeasurably to the 2006 edition’s effectiveness. The new Eyes doesn’t attempt to alter the nature of the villains, though. In fact, it’s a pretty literal remake that doesn’t do much to change the original’s stories and arcs. Because of that, I should probably gripe about how the mutants’ presence neuters the horror, but that doesn’t occur for the 2006 Eyes. Although the mutants add a fantasy element, the movie more than compensates with its terror. Honestly, this is one of the most horrific and nightmarish flicks I’ve seen in some time. Most movies in this genre wink and nudge so much that they don’t make much of an impact. The 2006 Eyes avoids that and turns into a genuinely unsettling experience. Maybe the mutants work better here because of the improved production values. I’m not sure, but all I know is that they added to the terror and didn’t detract as in the first movie. They’re so creepy to see that they made the film even more of a trip into hell. I don’t rattle easily, but this flick created a truly disturbing experience. If I had to complain about the new Eyes, I’d focus on the presence of too much exposition. The story beats us over the head with its theme of nuclear mutations. If I recall correctly, the original presented this issue in a subtler manner. The 2006 version really spells out the topic, and that gets tiresome, especially since the filmmakers seem to think we’re idiots. They remind us of the nuclear subject so much that they appear to feel we’ll forget if not nudged every few minutes. I also could have lived without the prologue. It presents a few minutes of graphic violence before the movie really starts. I think the filmmakers did this to ensure we’d not have to wait a long time before anything overtly horrific happens, but I believe this decision undercuts some of the later scenes’ effectiveness. Hostel did the same thing, and the choice telegraphs the terror too much. I think the story would work better if it didn’t so strongly imply the impending doom; let it unfold naturally. Still, I feel The Hills Have Eyes works surprisingly well. It presents a story packed with real horror and doesn’t pull any punches. The graphic violence occasionally seems a bit gratuitous, but the movie doesn’t play things in a manner that revels in the gore. Instead, it does so to remind us of the terrible repercussions. This is a rough, effective horror movie. 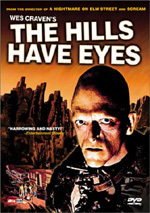 The Hills Have Eyes appears in an aspect ratio of approximately 2.35:1 on this single-sided, double-layered DVD; the image has been enhanced for 16X9 televisions. Despite many positives, a few problems meant this transfer showed moderate weaknesses. My main complaint related to shadows. The movie used a lot of low-light shots, and they occasionally looked too opaque and dense. Some of this stemmed from the use of “day for night” photography, but other images just seemed too dark for no logical reason. At least blacks remained deep and tight. Otherwise, this was a solid transfer. I noticed a little edge enhancement and some shimmering in the craggy landscapes, but sharpness almost always looked excellent. Only a sliver of softness ever marred the proceedings. For the most part, the movie was tight and crisp. No jagged edges interfered, and source flaws were absent. Given the film’s desert setting, I didn’t expect much from the palette. That’s good, since it never did much to bring out a variety of hues. Colors stayed simple to fit the landscape. The tones were accurate and appropriately delineated. Other than the excessive murkiness of shadows, Eyes provided a solid transfer. The Dolby Digital 5.1 soundtrack of The Hills Have Eyes managed to help accentuate the movie’s scares. It provided a particularly creepy setting. This was especially true during the scenes in which the mutants indirectly threatened the Carters. Voices and footsteps popped up all around the room and formed an unsettling sensibility. The louder action scenes were also well rendered, as the filled the soundscape well. Audio quality remained positive. Speech was distinctive and natural, and I noticed no issues with intelligibility. Music seemed clear and dynamic. The score showed good reproduction at all times. Effects came across as crisp and full. They lacked distortion and were always quite strong. This was a consistently good soundtrack. When we shift to the extras, we get two separate audio commentaries. The first comes from screenwriter/director Alexandre Aja, screenwriter/art director Gregory Levasseur, and producer Marianne Maddalena. All three sit together and provide a running, screen-specific discussion. This piece looks at storytelling issues and characters, cast and performances, locations, sets, and related complications. The film’s photographic style and cinematographic choices, edits and changes made for the unrated cut, stunts, effects, and various production concerns. The commentary hits on the appropriate issues and does so in an entertaining way. Some may find it tough to slog through the French accents of Aja and Levasseur, but I didn’t have any trouble understanding them. They show decent passion for the flick and offer an informative examination of the movie’s creation. For the second chat, we hear from producers Wes Craven and Peter Locke. Both sit together for their running, screen-specific piece. As you listen, you may wonder what Craven did for the production. Stuck working on post-production for Red Eye, he didn’t visit the set, so it appears he had little involvement in matters. This means he asks Locke about details and talks more about the original film than the remake. Craven makes comparisons to his version, and that’s good. He also gives us notes about the 1977 take’s production, and that’s not so good. His comments are reasonably interesting but out of place; he should leave that material for the 1977 Hills DVD. Because of Craven’s lack of involvement in the production, this leaves Locke to carry the bulk of the commentary’s informative portions. He does okay at this, though I can’t say we learn much in the way of new material. Locke tells stories better than the Frenchies on the first track, but outside of a few fun anecdotes, he sheds little light on undiscussed areas. Locke also runs out of steam as things progress and doesn’t say as much during the movie’s second half. Craven jokes a lot throughout the film, and this tone dominates the final hour or so of Eyes. Some of this is amusing, but it gets tiresome, especially since Craven tends to recycle the same jokes; he makes about a million “kids, don’t do this at home” cracks. Locke and Craven present a breezy enough commentary, but not one with a lot of informational merit. Next comes a 50-minute and 21-second documentary entitled Surviving the Hills: Making of The Hills Have Eyes. It mixes movie scenes, behind the scenes materials, and interviews. We hear from Locke, Maddalena, Aja, Levasseur, Craven, production designer Joseph Nemec III, special makeup designer Greg Nicotero, visual effects coordinator Danilo Bollettini, visual effects supervisor Jamison Goei, director of photography Maxime Alexandre, and actors Aaron Stanford, Emilie de Ravin, Ted Levine, Kathleen Quinlan, Dan Byrd, Vinessa Shaw, Robert Joy, Billy Drago and Michael Bailey Smith. The show looks at the development of the remake and the approach taken by the filmmakers, shooting some of the major sequences like the car crash and the trailer attack, locations, sets and production design. We also learn about attempts to base the film’s horror in reality, makeup and hill-dweller visuals, working with animals and kids, visual effects, music, and a few other production issues. Since the commentaries cover so much information, we encounter more than a little redundancy here. That said, the program provides a very nice overview of the various issues. It offers good behind the scenes footage that expands the verbal discussions of the areas, and the extra participants add depth to the piece. This becomes a very good program. Production Diaries fill 11 minutes and six minutes. These come from the set and show us various aspects of the production. We observe the multinational nature of the crew, shooting some bloody sequences, animal wranglers, stunts, and weather problems. Normally I really like this kind of footage, but I must admit this collection left me a bit cold. We see a few interesting bits but nothing that comes across as particularly memorable to me. Next we find a Music Video for “Leave the Broken Hearts” from the Finalist. This generic modern semi-metal track sounds like about a million other songs in its genre. The video is also quite ordinary as it mixes movie scenes and lip-synch performance. Skip it. The DVD opens with a promo for Fox’s thrillers. No trailer for Eyes appears here. One of the more brutal and relentless horror films I’ve seen, The Hills Have Eyes packed a serious punch. It truly felt like a nightmare as it presented a family’s descent into hell with power. The DVD offered good picture, audio and extras. This was a better than average DVD for a strong flick. It’s too dark to be for everyone, but fans of the genre should get into it.